One of the traits many people look for in a partner is good listening skills. But what does it actually take to qualify as a “good listener”? Imagine the following scenario—someone gets upset because they feel their partner is not listening to them. The partner counters by repeating the most recent lines that were spoken, to prove they were indeed listening. This response shows they heard the words, not that they were being a good listener. There are many other factors we must consider besides hearing, to recognize good listening skills. First is providing undivided attention. While having a conversation, if you are simultaneously watching a baseball game or flipping through a clothing catalogue, you are not being the best listener you can be. Find a time when both parties can provide their complete attention. Next, remember that listening involves two senses—hearing and seeing. Of course you must hear the words, but communication is largely about body language. A good listener additionally looks for nonverbal cues to properly understand what is said. Facial expressions and posture are two examples of cues which are an important part of connection. Finally, hearing is meaningless until the words are processed and understood. Absorb what was said, and provide a response when appropriate. If you do not understanding something, ask the person for clarification. Sometimes it may take interpreting, while other cases may be more straightforward. Always remember that listening is multifaceted. If communication is an issue in your relationship or family, professional counseling may be beneficial. If you are in Bergen County, New Jersey, feel free to call 201-368-3700 to find out more information or make an appointment with one of our own licensed professional counselors, therapists, psychologists or psychiatrists who have helped many with troubles such as yours. Nice summary of a very complex skill/attribute. 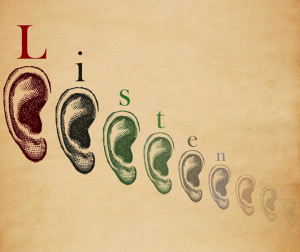 We at Listening Impact also say that listening is a habit formed in our brain, body and emotions over a lifetime. So, each of us listens differently and we expect our unique profile to be understood and addressed. Thanks. So true! Communication requires finding a way for different listening styles to work together so the message gets across. Thanks for your comment!